t*rexes and tiaras: I had watched you taking in the spring.. This week the weather has been a bit of a mixed bag, hasn't it? 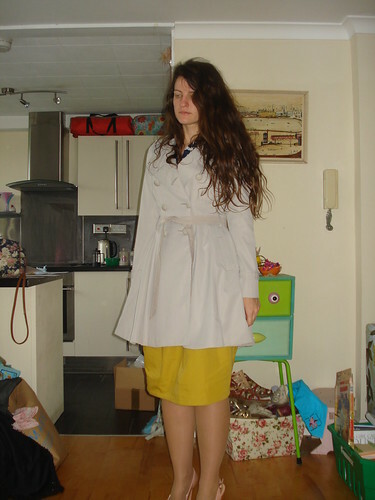 The other day, I was leaving the house about 6.30am (as usual) and it looked rather grey and rainy, so I thought I'd better throw the trench coat on, which I'd picked up in Leeds a couple of weekends ago. Thankfully it sort of matched my outfit. It seems to be becoming quite the habit, staying for a weekend at a friend's house and then coming home with armfuls of their clothing cast-offs. Thank you to Rosie for the newest addition to my #WardrobeZoo; this horse print blouse. 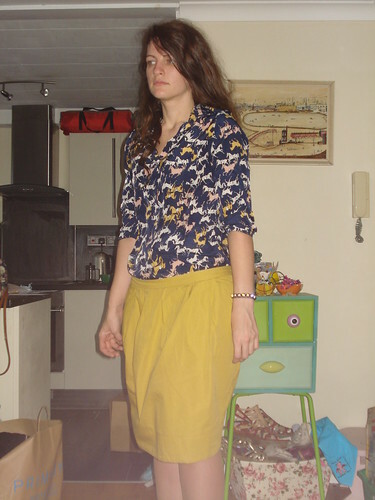 I couldn't wait to wear it, and knew I had a mustard skirt somewhere. 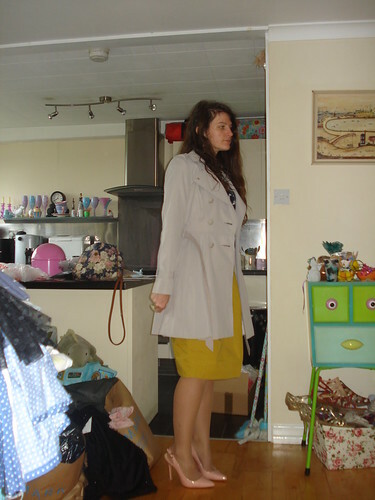 I wore it despite the fact it's definitely too big, so it's now been moved into the blog sale pile. If you haven't had a look, I have a LOT of items on there, and more going up most days. The clear out seems to be a gradual process, but I'm sure it's one of those "slow and steady" things. 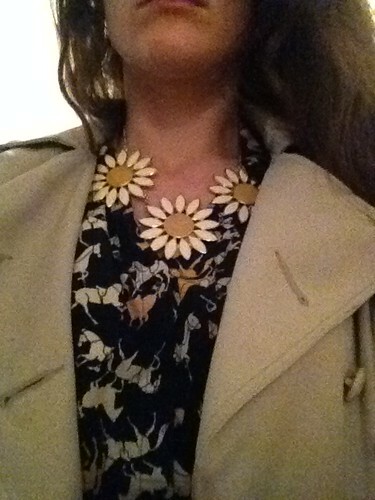 Another thing I've been anxious to wear was this daisy necklace, picked up from a little vintage shop called Alice Found Treasure in the Corn Exchange in Leeds. I think it's colours worked quite well with the skirt and the blouse, which I also tried to match to my shoes. This being their second wear, I'm still not entirely convinced about them. The elasticated slingback straps seem to be pretty loose on the backs of my feet, which can lead to a lot of time spent re-adjusting them. I think it's because they're a little too big for my feet, which fall to the front of them and away from the strap at the back. Who knew I could ramble on for so long about shoes? If anyone is qualified to ramble about shoes it's you! The shirt is ace! It looks fab with mustard. I like the idea of a wardrobe sort out being a slow and steady process. If I could just get rid of stuff at a faster pace than I add stuff, I could be onto a winner! Those shoes.. They're just perfect!